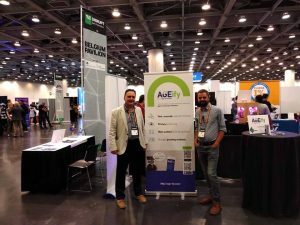 AGEify, our innovative application for online age verification, participated in TechCrunch Disrupt San Francisco, from 5 to 7 September 2018, at Moscone West. TechCrunch is one of the biggest exhibitions in the world, dedicated to startups, workshops, programming and demos at the new categories like AI, CRISPR, blockchain, mobility, crypto-currencies, AR/VR, autonomous vehicles space and robotics. 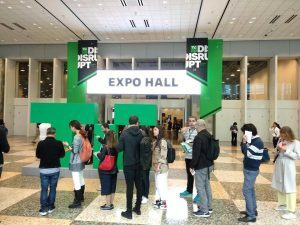 Specifically, this year Disrupt lasted 3 days, focused on breaking technology news and developments with big-name thought leaders who are making waves in the industry. At the heart of the conference lies Startup Alley, the startup exhibition hall, where hundreds of early-stage startups showcase their latest developments. Indeed, throughout the event, many activations, workshops and parties were held and led to networking and discovery within the tech ecosystem. The AGEify’s team joined in the TechCrunch Disrupt, presenting our innovative application, showing that AGEify is committed to solving the problem of age verification, which exists for many years. Our application constitutes an easy, accurate and privacy-preserving manner, which through several methods, enables the validation of any age, including minors. Currently, the first version of our solution is already available and we are looking for partners to use and expand it internationally.